While these Ring Warming Ceremonies are best to be done at outdoor weddings, the event itself will definitely leave a lasting impression upon you and your guests. All you need is a long string of ribbon that weave around each row of seats. 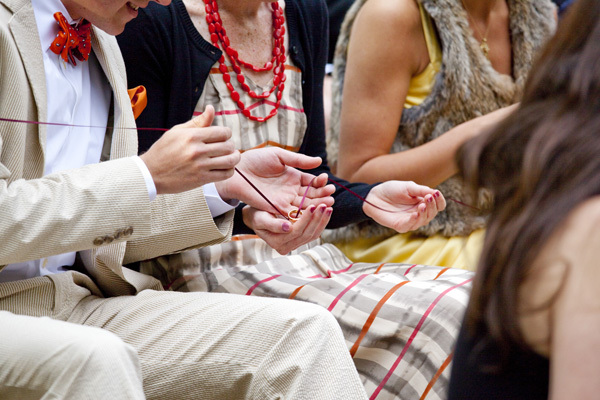 Have someone to release the rings at one end and each guest will touch (or “warm up) your rings and say a blessing/a prayer/a quote (in silence or out loud – it’s up to them!). Then the rings will be passed on the next guests until it reaches the end of the string. At the end of the string, a parent will give those rings to you right before you say your vows to each other. Don’t forget to have your videographer to record this! You will love it for years to come. What do you do to make your ceremony unique? Posted in Real Weddings, Sustainability and tagged green wedding, minneapolis unique ceremony, outdoor ceremony, ring warming ceremony, unique ceremony idea. Bookmark the permalink.